My first time wearing S in the Solly Baby. I liked the Solly Baby as a soft unstructured wrap. It is lightweight, so especially good for warmer months. Like all wraps, it is a little complicated to put on, but you should get the hang of it quickly. I wouldn’t put it on outside because it tends to touch the floor as you put it on (though I hear there are tricks to avoid that). I used it around the house and for quick errands outside the first three or four months. It is really lightweight, which is good for a few reasons: it makes it much less overwhelming, much more comfortable in warmer months / climates, and more comfortable even in cold climates (wearing a baby produces a lot of body heat). The Boba Wrap is a less expensive alternative that is really popular. I can't personally vouch for it, but if you don't want to splurge on the Solly, you might want to look into it. When I was pregnant, I did a lot of research and was convinced that the Ergo 360 was the best carrier. I was really excited to try it once my son was born, but I ended up completely disappointed. I found it really difficult to put on and all of the straps were so overwhelming. Plus you need to use an infant insert (sold separately), which makes it even more overwhelming and hot to wear in the summer. I also really disliked the Velcro waistband -- it makes it difficult to adjust the waist once it is on and the Velcro destroys your clothes. I really wanted to make the Ergo work for me but finally gave up. I've since met so many people who had similar experiences. I did some more research and attended a baby wearing clinic with Bianca from Metrominis, where I tried a bunch of carriers. I ended up choosing the Catbird Pikkolo (in Zyphyr, which is a grey/stone color). Scroll down to see a picture of me and baby S in the carrier. I find it to be much more comfortable, sleeker and more streamlined than the Ergo. I like that you can adjust the straps easily at the front/side, instead of having to reach all the way back. I thought I would love having the ability to cross the straps, but actually find it more comfortable to wear it backpack style. My husband likes it too. It can hold a baby up to 40 lbs and be worn four different ways, so I hope to be able to use it for a long time. You can buy it with or without the waist support belt. I chose to get it without because I find that most support belts shift and don't actually provide much support. When I attended the clinic, the Catbird Pikkolo was out of stock in Zyphyr. Bianca was nice enough to loan me her demo and not charge me until my carrier was ready to ship. The demo had been around the block and washed many times and still looked great and worked perfectly. 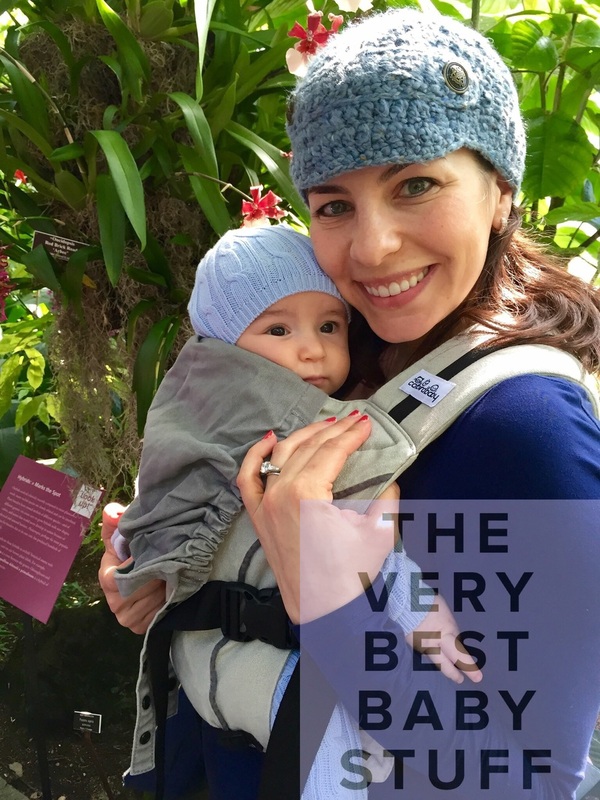 Me and Baby S in his Catbird Pikkalo at the NY Botanical Gardens Orchid Show. My runner up choice was the Becco Gemini. Like the Catbird Pikkolo, it crosses in back. It is easier to put on than the Ergo but it has safety buckles, which make it harder to put on / take off than the Catbird Pikkolo. The safety buckles are good in theory, but require two hands to open, which can be difficult to manage with a squirming baby. The Becco Gemini can be used only up to 35 pounds and has an attached waist support belt. A few of my friends have the Becco Gemini and the petite ones are especially happy with it. I think it is a solid choice. Before I met Bianca, a friend loaned me her Tula Baby Carrier. Tula carriers come in really cute patterns and have a cult following. I didn't find it to be supportive enough and was somewhere between the Ergo 360 and Catbird Pikkolo in terms of ease of putting on and taking off. The fabric is really soft, similar to the Catbird Pikkolo. 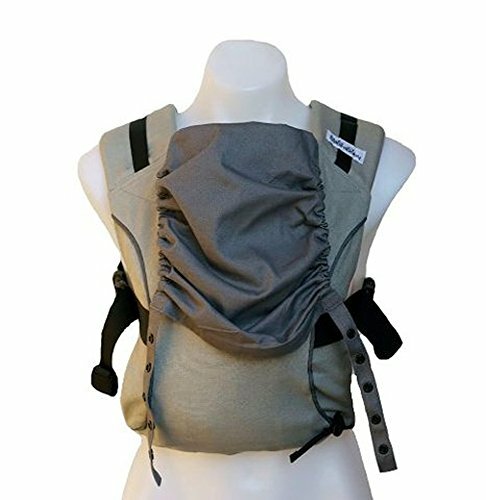 I also tried the LILLEbaby Complete All Seasons 6-in-1 Baby Carrier and found it to have all the issues of the Ergo 360 and even less attractive. These are another option but I haven't tried them. If you are interested you should contact Bianca from Metrominis or find a baby wearing group in your area. My Kate Spade Wristlet. This comfortably holds my phone, money, keys and lip balm or lipstick. It has become my everyday wallet (I keep my Metro Card and Work ID in the exterior pocket). It is a really soft leather, so it doesn't get in the way. HABA Bon Voyage Pacifier Chain if I'm taking a pacifier (it works with MAM pacifiers). It is cuter than most pacifier chains and I prefer it over the ones that have suspender clips. Lil' Sidekick - Safe Utensil and Toy Leash to attach a toy. This thing is awesome, I also use it to attach toys to the stroller and you can use it to keep sippy cups from falling off the highchair. It is made of silicone, dishwasher safe and the star makes it super cute. If I'm going out for more than a few minutes I bring diapering essentials in the zip off portion of the Skip Hop Pronto Changing Pad, which can also be worn as a wristlet. Please also see my post on Diapering Essentials. If it is cold or sunny I put a Bambinoland organic swaddle or Aden + Anais Cotton Swaddle over the carrier and tuck in into the sides of the carrier to protect him from the cold or sun. Look out for my upcoming post on swaddles. A selfie of me and baby S in the Solly wrap in his nursery. If you enjoyed this post, please foliow me on social media to get notifications of new posts.